The facing bevels produce a V-shaped groove that hides most imperfections. I’m sneaking this post in on a Monday for those of you who enjoy reading about woodworking. This short study on how to go from boards to product is somewhat inspired by my blog-buddy Dan over on the other coast. Dan wrote about people who have lost thumbs and fingers. It’s a really good post. Feel free to take a few minutes and read that. Seriously, I can wait. The reason I say that that post somewhat inspired this one, is because “production” woodworking, the kind where you are repeating the same operation many times, is a good way for an amateur woodworker to get seriously hurt. In industrial settings, dangerous operations are automated. That’s not usually possible in a small shop. Cut – The first step was easy, safe and fast. I had to cut 10 four foot long blanks out of the long boards. 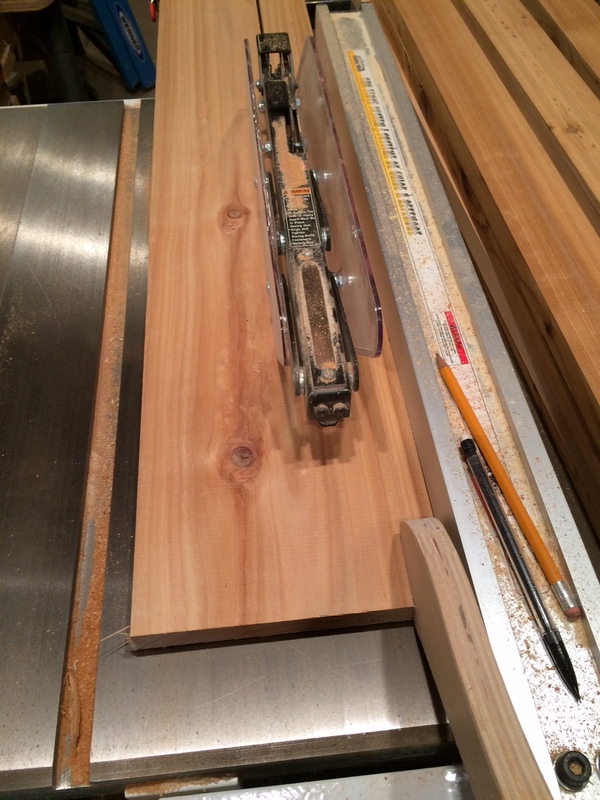 Since three of the boards were 12 feet long, I only needed to make seven cuts. The chop saw makes quick work of producing the 4-foot blanks. RIP – This was the first production step. Each blank yielded three 2 ¼ ” (that’s the symbol for inches for you metric folks) wide strips, but each sequence of three cuts brought me closer to the blade. 30 cuts were required. Several years ago, this kind of operation ended with my left index finger following a board through the saw, slicing the end of my finger in half. Thanks to a talented seamstress (actually a Physician’s Assistant), I can still count to ten. The edges were surfaced at this point, reducing the strips to 2 1/16” wide. Guards in place and push-sticks in use. 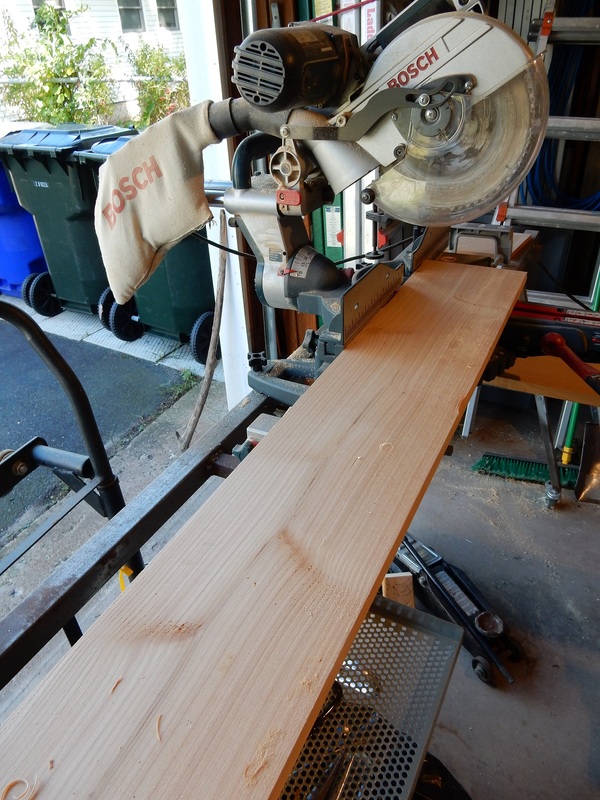 Slice – Resaw the 30 strips into 60 strips that are ~ 7/16” thick. Since one side of the cedar was rough, the slice was a little off-center at the bandsaw, so I could put one piece through the planer on each side. Push-sticks in use here too and no need to push anywhere near that blade. 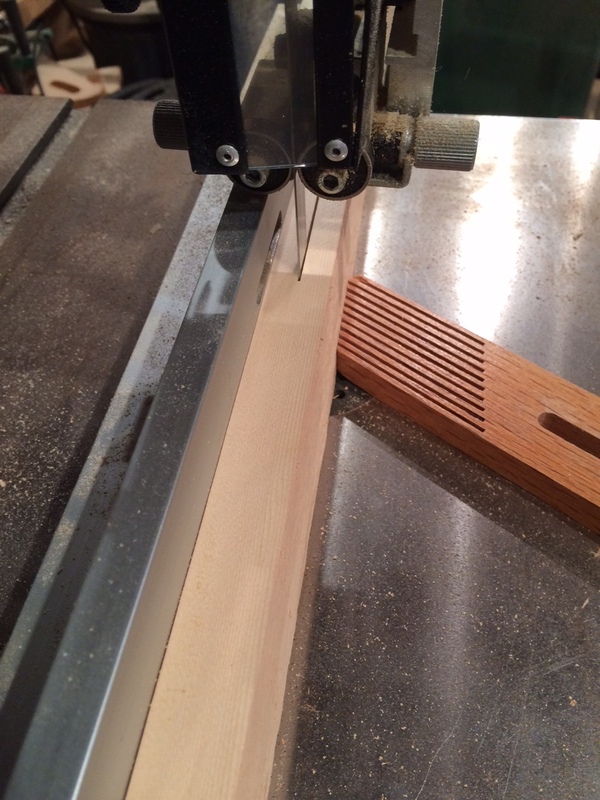 Shape – The shaper is the most effective tool I own for cutting the “rabbet” notch on opposite sides of each strip. This is a very dangerous operation so I added “hold-down” guides to keep the strips engaged with the cutter and prevent my fingers from going along for the ride. In 120 passes, my fingers bumped into the guides three times. Infeed side of the shaper. The guides keep the strip engaged with the cutter as I feed the strip forward. Fingers prevented from getting near cutter. Outfeed side of the shaper. Once the strip passes the fence, it can be safely pulled through. Shave – The strips were simply too narrow and thin for me to risk running them through a power tool. A production shop would have a special cutter head that could mill the rabbet and bevel in one pass. I did it by hand because it’s safer and these are two of my favorite tools to use. I had the knife set so that only three passes were required, but that’s a total of 360 strokes. The result is a series of strips whose beveled edges will form a V-groove as they cover the distance on the wall. I’ll also be using some of these to form the backs of a couple of little shelving units. This is why you make more than you need and why you don’t stand in front of the planer. This flew out pretty fast. My daughter used to like to play with these. Now, my wife will use them with kindling to start fires in the wood stove. The hold-down blocks allow for rapid placement and release of the strips. The shoulder plane (right) does a good job on the bevel over the notch (foreground). The block plane handles the other edge. The rabbets are cut and this was a good stopping point. These are ready to have the rabets cut. Two passes on each strip. We’re done at the table saw, ready to have the edges surfaces and then be sliced in two. Four foot blanks. We’re ready to start production. Thanks John. I know there aren’t a lot of woodworkers out there in my community, so I’m glad to see someone enjoy the post. It was fun, and I felt like I accomplished something. He takes very good care of me Judy. This is a labor of love. Cutting cedar? It must have smelled like heaven. I learned in the steel foundry to stop and take a deep breath before each action. It slows you down and dissipates the impulse to hurry. The garage does smell wonderful. It’s funny you mention the deep breath. Production work is a combination of finding ways to go faster and ways to slow down. When I cut my finger, I had several operations that had to be performed with the table saw guard removed. That’s when I really needed to slow down. Slowing down might also prevent ruining the piece too. That was especially true of the hand planing operation. I started out making 5 passes with each plane. Then I moved the knife to get it done in four, then three. I tried two, but then the cedar started tearing, so back to three it was. The pictures really helped me appreciate and understand your descriptions. 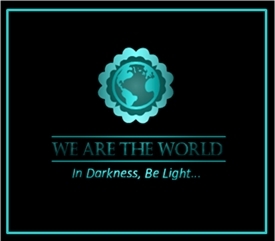 Awesome, and very inspiring! You are a very well rounded person. Thanks Elizabeth. I’m trying to learn how to present this information in a way that makes sense to both experienced woodworkers and people without that experience. This really makes me appreciate trim work in a whole new way. Ha ha. This is why you work with stock items you can buy at Home Depot. He needed something unique. “I literally can’t even,” she says as she sips her tea. Good for you, Phew! I’d be bloodied and bandaged within minutes! What a fun afternoon break for me, Dan. And look at you making all the cool videos! That first one sure makes a mess… But it’s interesting the different shapes and textures of the “leavings” from the different tools (okay, that’s the erstwhile artist and textile student in me). I’m glad there was no foamy pink stuff this time! Mega hugs! Thanks Teagan. I am always fascinated by the planer chips. The finger I cut in half is also the finger I routed. It seems to be my go to finger when damage needs to be done. Man o Live. My jaw is sitting on the keyboard. What a beautiful project. I wonder why you chose cedar for wainscoting? Moths? 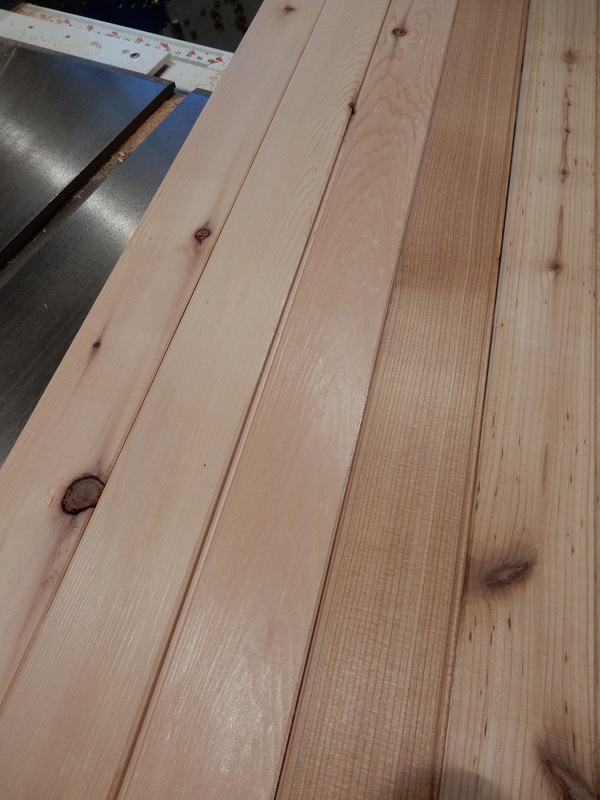 It’s for a bathroom that has a cedar surround above a walk-in tub. It’s a long story but this will be a nice touch. Cedar doesn’t mind getting wet. I just love the title of this post! It should be a song title. “Here’s Dan and the Woodworkers doing their newest hit single, “Rip, Slice, Surface, Shape, Shave.” Yeah!!! Thanks Lois. I don’t think I’ll be on stage anytime soon, but I did like the rhythm of the title. I liked your post because I love the smell of cedar shavings. I should send you a bag :) The garage did have a really nice smell to it after running the strips through the planer. The garbage can will smell nice for one week I guess. Thanks for stopping by the shop. Many trades like woodworking are becoming a lost art. I have the utmost respect for people who keep craftsmanship alive. Watch those fingers, Dan, but please keep doing what you’re doing and writing about it. I applaud you. Thanks Wendy. Commercially made wainscoting probably goes from board to finished product without bring touched by human hands. I like knowing how to go these things and I like the fact that my daughter and others are interested in knowing how these things were (and still can be) done. Good post. Thanks for the mention. I may yet take up wood working . Meanwhile , I guess word working will have to do . You do that pretty well Dan. Thanks for the comment and the inspiration.